I almost said Happy Monday and then I realized it's Terrific Tuesday...lol! The end of the school year is as exhausting as the beginning of the school year! If you've visited recently, you might remember me talking about the milk and honey theme I am going for in my kitchen and dining room. If not, you can click on the link and go read about it if you want. You can also see a fun little makeover from yesterday's post here if you missed it. I am sharing a couple things I added to my Milk & Honey theme today for no cost. See if you can find what it may "bee" in the photo below. Did you notice a few little bees on the plate shelf? My mama gave them to me. They were on a wind chime that broke and she thought I might use them for something. Perfect timing! Did you also notice the bee in the frame? I found some free sheet music on the Internet of The Flight of Bumble Bee and thought it would be perfect to print this bee graphic on. I have been wanting to use this gold frame (thrifted last year) for a while now and think it is perfect with this print in it. Here's where I placed it for now....on my kitchen windowsill. Ignore the clean dishes on the lower right side. I had just finished dishes...no, I do not have a dishwasher. I hand wash my dishes. I do plan to install a dishwasher when we ever get around to remodeling the kitchen. I've never had one, so I don't miss what I've never had, but I do hope to have one eventually! It's all good though...and I am blessed. Have a lovely Wednesday! That title may be a little misleading! I have had some busy time but lots of down time too! Anywho, ever since I got my bee plate in the mail from Anthropologie....remember it. I just LOVE it and have been wanting to add in some more bee things. This as been pretty easy since I already own a couple things and I bought the burlap bee candle holder that I shared here. I created a new vignette on the table and included my thrifted honey jar that I have had for a while now. I am trying to think of something better to put in the lace edged milk glass dish, but haven't come up with anything yet. Any ideas? Here's a close-up of the honey jar. I added my new bee candle holder to the shelf on my mint green mirror and switched out the sheep for a mother and baby quail and changed the word on my scrabble tiles from spring to faith. I like it! I need something different in the burlap candle holder. Maybe some fresh grapevine from my yard! I already had this beautiful frosted glass candy dish on the buffet. It belonged to my Granny Valentine and I just love it. I have seen one just like it on the Internet for $200! I would never sell mine though. Here's a better look at the side. And here's the lid...isn't it pretty? 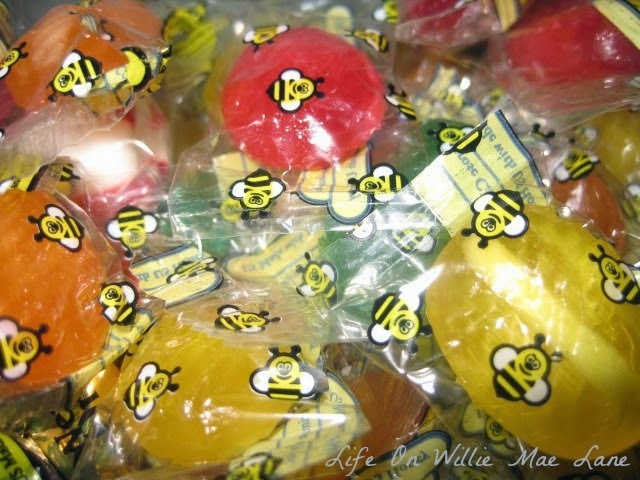 And even the candy inside has bees on the wrapper. It is produced locally and has honey in it. I am pretty sweet on this new understated bee theme. I think I might keep it for a while! I have actually been thinking it goes well with the look I am slowly trying to achieve. I love farmhouse style and think bees goes nicely with it. I have a little bit of a milk theme going in the kitchen and think I may need to make a sign that says Milk & Honey. I may make a chalkboard platter that I saw recently and put it on that. The hubby and I have big plans this summer to redo our library, dining room, living room, and master bath! I hope and pray we can get it all done. Hope you are enjoying Memorial Day weekend. I am truly grateful to those men and women who have served and continue to serve this glorious country I call home. I had such a nice day out with the hubby yesterday. I had to have blood drawn for labs and he had to get some x-rays, so we both took the day off work to get these things done and then spent a fun day together. We ate a yummy lunch at Red Robin...I had a bruschetta grilled chicken sandwich that was very tasty. The hubs had a burger...he's a burger lover! After lunch, we headed to the movie theater. We had about half an hour to wait and lucky for me...Tuesday Morning is just around the corner from the movie theater, so of f we went. I found several little things to bring home with me. First up was this burlap covered glass vase/candle holder. I actually found one similar at TJ Maxx a while back that I wanted but the bee image was not centered, so I passed on it. This one looks great. I had to have it. I also got this boxwood ball. I have been wanting some faux boxwood but it is normally really pricey. This little guy was only $2.95! and some stamps and colored pencils. I love Tuesday Morning but I hardly ever get to go. They have so many lovely things! I bought a couple other things too that I forgot to take pictures of. The movie was really good...we both enjoyed it. After the movie, I needed wanted to run by the new Jo-Ann's fabric and craft store. I had not been to the new one yet and I was in awe! It is huge...I could have spent a few hours in there but I didn't. That's not the hubby's cup of tea, but he was a good sport and didn't complain. I bought a few things while I was there. I needed a few more fabrics for making yo-yo's. These are the ones I got. All the fat quarters were just $0.99 yesterday! I loved this print too and bought a quarter yard of it as well. I also bought the items below. The fabric is what I went to Jo-Ann's for to begin with. I have been needing a coral colored fabric for a project I wanted to complete. I found this piece which has silver polka dots on it and love it! The other items are for the project as well. It will be combined with this tea towel I bought a few weeks ago. I am almost finished with it and will share soon! I have to get the hubby to help me with the grommets tomorrow. I hope you are having a wonderful Memorial Day weekend. I am enjoying mine very much! 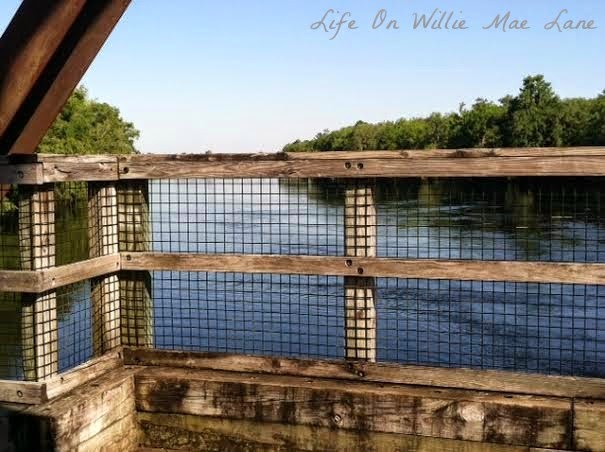 Today I'm sharing a beautiful, local spot that I always enjoy visiting. 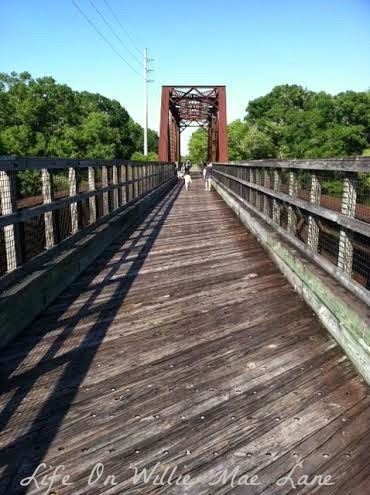 This old train trestle crosses over the Suwannee River and is now used as part of a walking path called the Nature Coast State Trail. Last Saturday I walked to it to see my niece Taylor have some pictures taken before her prom. While we were there, I snapped a couple photos to share. 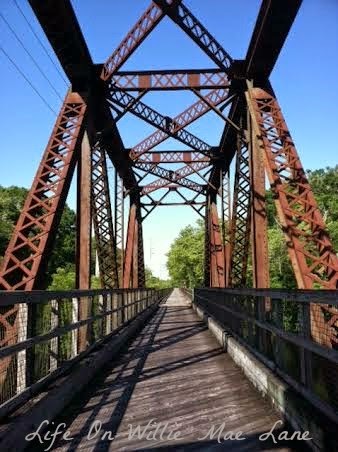 I love the architecture of this old train trestle and the rusty patina makes it even more gorgeous. Our Suwanee River is so high right now. There is no possibility of taking the boat out any time soon due to the logs and debris floating in the water. It is very dangerous when it is so high. This is the third summer in a row that our river has been too high to go boating. I miss it...it is always soothing to my soul. Life is so busy right now and some health issues for both myself and my hubby have me worried. I would love to take a ride out on this beautiful river to restore some peace to my soul. I just have to keep my faith and give my worries over to God. That is so much easier said than done sometimes though. I am trying...I really am. I would appreciate any thoughts or prayers you have to offer. Want to see something pretty? 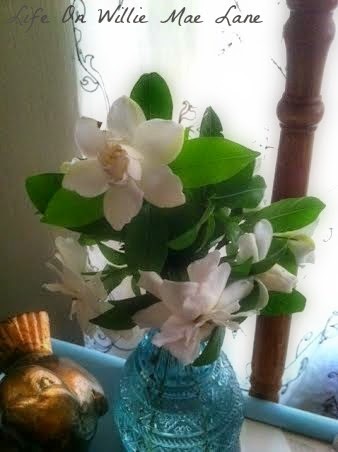 Look at the gardenias I picked from my mama's yard. I just love these gorgeous white blooms and the smell is heavenly! Now...just one more thing....I want to share a bit of AWESOME news! Some of you have been praying for my friend Heather who has Stage 4 Colon cancer that had spread to the liver. Well, Monday she had a PET scan and MRI and 3 of the 4 spots on her liver are gone and the 4th one has shrunk by 1/3 and she's only halfway through her chemo! God is working a miracle in Heather's body. She is so full of faith and positivity and so am I! I have felt all along that God was going to heal her. She still needs the prayers as she has a long way to go but I just wanted to update you. Her son took this picture of her...he has recently taken up her photography hobby. He is really good! Thanks so much for thinking of and praying for my beautiful friend. Have a blessed and beautiful rest of the week!